Precious metals futures finished lower Thursday with losses ranging from 0.1% for gold to 1.3% for platinum. Gold for December delivery dipped $1.30 to settle at $1,201.60 an ounce on the Comex division of the New York Mercantile Exchange. "The U.S. economy is still in a very good place. The expectations of a rate hike next year is tilting toward four from three," Reuters quoted Nicholas Cawley, an analyst at DailyFX.com. "The higher the rates, the more attractive for investors looking for safe haven to move into U.S. Treasuries than gold." 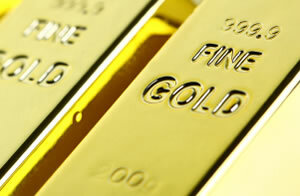 Gold futures ranged from a low of $1,199.60 to a high of $1,210.70. They shed 0.3% on Wednesday, rose 1.3% on Tuesday — ending at a two-week high, and lost 0.4% on Monday. Elsewhere, silver for December fell 8 cents, or 0.6%, to settle at $14.59 an ounce. Silver futures traded between $14.56 and $14.81. They declined 0.2% on Wednesday, gained 1.3% on Tuesday, and fell 1.4% on Monday. January platinum dropped $11.20 to $824.50 an ounce, ranging from $823.20 to $836.40. Palladium for December delivery fell $7.50, or 0.7%, to $1,045.50 an ounce, trading between $1,041.10 and $1,056.90 an ounce. Last Friday, it ended at $1,072.80 an ounce for its best close since late January. Gold rose $2.25, or 0.2%, to 1,203.45 an ounce. Silver declined 10.5 cents, or 0.7%, to $14.63 an ounce.